In its 125 year history, Breitling has had great success being at the forefront of developing timepieces intended for pilots. Perhaps until now, most famously with its Navitimer line whose circular slide rule is capable of handling all the essential calculations relating to airborne navigation. The latest creation to be unveiled by the brand is the Chronospace, a multifunction wrist instrument geared towards the “professional aviator” with its cutting-edge electronics. The new timepiece features a steel case with a screwed in case-back and resonance chamber. It boasts water-resistant to 5 bars. 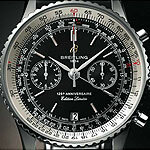 The bezel on the watch is a bidirectional rotating pinion bezel (slide rule). The Chronospace is powered by the Breitling Caliber 78 SuperQuartz™ movement, an officially chronometer-certified by the COSC. The movement functions include a 1/100th of a second chronograph with split times, alarm, countdown, dual timezone display with independent alarm, 24-hour military time, Coordinated Universal Time (UTC), slide rule, battery end-of-life indicator and a perpetual calendar. The dial on the timepiece is available in several color choices - Volcano black, Mariner blue, Tungsten gray and Stratus silver. The watch’s LCD screens are equipped with high-performance NVG-compatible backlighting system to ensure optimal readability in all lighting conditions. The watches functions are indicated by oversized hands, along with luminescent hour-markers and large 3 and 9 o’clock numerals. The Chronospace is also available with a variety of bracelet choices including leather, rubber Diver Pro, rubber Ocean Racer/woven steel Aero Classic. 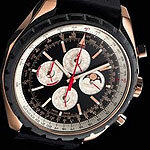 Breitling has unveiled two limited editions of its Chrono-Matic watch to celebrate the 40th anniversary of the companies first automatic chronograph movement, the Chrono-Matic QP & 1461. 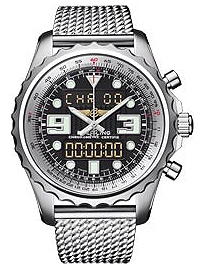 In 1969 Breitling introduced its first automatic chronograph movement which lead to the creation of the brands Chrono-Matic chronographs. Now the new 49mm diameter Chrono-Matic watches are a tribute to the first of these ultra-large watches. The Chrono-Matic 1461 chronograph watch is a limited series of 2,000 pieces and gets its name from its calendar mechanism which requires an adjustment only once every leap-year, or 1,461 days. The 49mm case is crafted from stainless steel and can come with an optional woven stainelss steel Aero Classic bracelet. The dial displays hours, minutes and seconds as well as the chronograph feature. The date, day and month are shown on the sub-dials indicted by the straight hands. 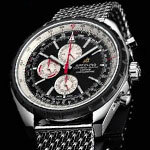 The second of the new limited edition Breitling watches is the Chrono-Matic QP. This beautiful watch has a 49mm 18 carat red gold case and is a limited edition of only 125 pieces. The QP is made up of 500 parts which come together to display the date, day, week, month, season, and moon phase. the watch has an impressive chronograph function, and an advanced perpetual calendar system. These new Breitling watches are special edition pieces created to add to the Airwolf and Skyracer chronographs collections. Each watch differs greatly from each other, but are part of a special new category Breitling is calling its Raven Chronographs. And while both have similar materials, with their high-tech black and steel look and rubber-molded push-pieces and bezel, these watches contain very different movements - One electronic and the other mechanical. 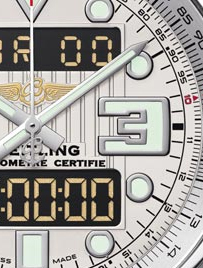 The Breitling Airwolf chronograph features an exclusive SuperQuartz calibre 78 movement. This COSC certified Chronometer movement is a themoline quartz which has a temperature sensor that adjusts the vibration frequency of the quartz crystal to adjust to temperatures so that the watch remains extremely accurate, to within a few seconds a year. It has a 1/100th of a second chronograph, a second timezone, countdown, alarm, and UTC. 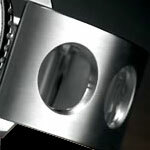 The case is 43.5mm wide and made from a highly polished steel with chronograph pushers. The two negative LCD screens have a second timezone, alarm, countdown timer, and perpetual calendar. The slide rule around the dial that is operated via the rotating bezel. The watch allows for excellent night visibility with its NVG-compatible display backlighting system. The Airwolf case-back has a turbine-shaped engraving which act as a resonance chamber for the alarm and other audible indications. The dial is available in black, silver, or grey. The Airworlf comes on a rubber strap with portholes and there will be a metal bracelet and leather or crocodile strap available as well. The Breitling Skyracer chronograph features the exclusive Caliber 27 movement that allows dual visualization of measured times and has a 48 hours power reserve. It has a 60-minute counter with a central hand that allows for perfect readability of any time measurement under one hour. For the measurement of longer periods of time, the dial has a single two-hand counter which displays hours and minutes. It features a rack-and-pinion mounted slide rule. This self winding chronograph is water resistant to 200 meters, and features a two-hand totalizer. 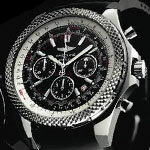 Breitling has announced the release of the Bentley Motors Speed chronograph, the newest edition to the Breitling for Bentley collection. The sporty and elegant line inspired by the prestigious Bentley automobile. The watch features a massive case size, measuring 48.7 mm in diameter produced in both stainless steel and a limited production of 500 pieces in 18 carat rose gold. The case is completed with a knurled bezel inspired by the Bentley control buttons. The dial comes in Black Velvet, Silver Storm and Bronze as well as Neptune exclusively for the stainless steel version. The dial is protected by a convex sapphire crystal with an anti-reflective treatment on both sides. The watch is available with a Barenia leather, crocodile or rubber strap as well as with a metal Speed bracelet. The Bentley Motors Speed chronograph is powered by the automatic movement, Breitling 25B caliber which beats at 28,800 vib/h. The movement has been COSC-certified and contains 38 rubies. The movement includes a unique mechanism called the 30-second chronograph, while the more common chronographs are 60-seconds. The variable tachometer allows the wearer the ability to measure average speed, independently of the time elapsed, the distance covered or the speed reached. The watch functions include 6-hour, 15-minute and small seconds at 6, 9 and 3 o’clock respectively as well as a date window at 4:30. 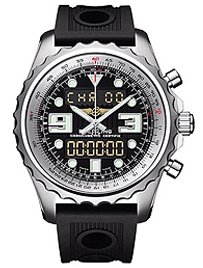 The Speed Chronograph is water resistant to 30 meters. In celebration of its 125th anniversary, Breitling is introducing a limited edition version of its Navitimer Chronograph watch. This beautiful watch will be produced in two versions, with 2009 pieces available in stainless steel and only 125 in 18 carat rose gold. The Navitimer allows for a wide range of calculations to be preformed on its classic slide rule bezel. The face of the watch is protected by a curved sapphire crystal which has a anti-reflective treatment on both sides, this results in optimal glare reduction. Each version has the choice of two dials - The Stainless steel model is available with a black or bronze dial, and the Rose gold version can be paired with a black or silver dial. The markers on each dial are polished applied baton indexes. My favorite part of the Anniversary Navitimer is the gorgeous "Air Racer" bracelet, this solid metal bracelet has several large circular cut-outs creating an interesting and unique look. The new Breitling Navitimer 125th Anniversary watch features a two-counter chronograph complication, the COSC certified Breitling 26 Caliber self-winding mechanical movement. 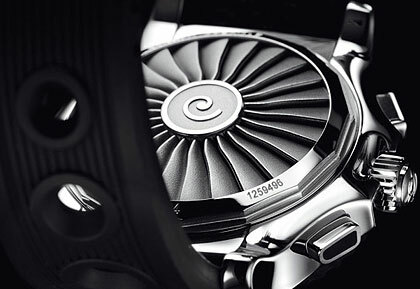 The movement beats at a frequency of 28,800 vibrations per hour. The chronograph function for the watch allows to record independent time intervals to within 1/8 second. The small date at 6 o’clock can be set by using the crown-adjustment. The movement allows for a 42-hour power-reserve and is water-resistant to 30 meters. 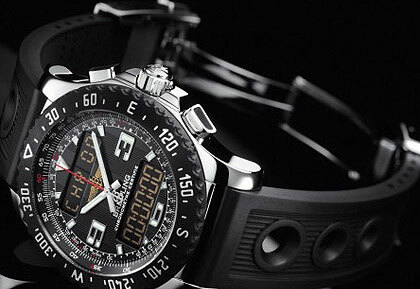 Breitling has jumped on the black case bandwagon, and I think that they have created a very nice looking timepiece. 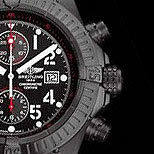 The newest addition to the Super Avenger collection is the Breitling Super Avenger Blacksteel Chronograph. A limited edition piece with a production number of 3000. The new black surface is accomplished by treating the large 48mm stainless steel case with a highly durable carbon nitride. The dial and sub-dials on the Blacksteel are also black and have the nice contrasting white hands and hour markers as well as red accents on the hands and for the tachymeter markers. The Blacksteel bezel is unidirectional rotating and has has a luminous dot for insured visibility. The dial is protected by a domed sapphire crystal, has a large screw-down crown and a screw-locked case-back which insures the 300 meters of water resistance. The strap is the traditional Brietling rubber strap which has a tang buckle with the same black carbon nitride treatment. 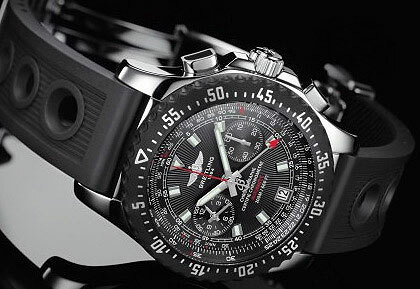 The Super Avenger Blacksteel Chronograph features the Breitling Caliber 13 movement, which has a date display, subsidiary seconds and chronograph complication. The power reserve for the watch is 42 hours.